KindEbook Wishlist updated to v6.4, see Post #2. (v6.4) Finally remembered to add a third (Abort) option to ADD, when an ebook exists in the database for another user. NOTE - Decided it was time for this, even if it has meant doing an update just for it only. It was meant to be included several updates back. With its inclusion, this might be the last update for a while, until Amazon makes some script breaking change I am guessing. I feel it is quite a mature program now ... but you just never know. 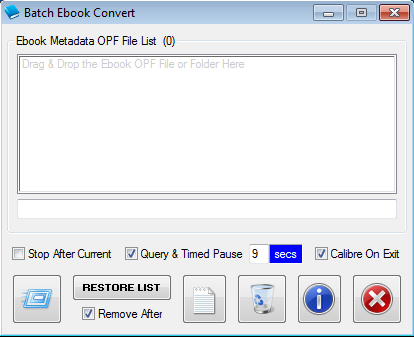 I have adapted my last program, ConvertEbook, merged it kind of with Batch Create & Run, and called it Batch Ebook Convert. I'm not uploading yet, as I have had a few more ideas, that I am way too tired to work on right now, but here is a screenshot ... which will change slightly. I have already given it some great improvements, that I will be adding to the next version of Batch Create & Run, plus the ones I haven't done yet. 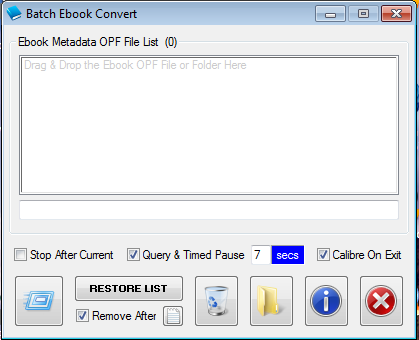 I have created and added a new program, Batch Ebook Convert, to the Suite. It is a merging together of ConvertEbook and Batch Create & Run, and fully replaces ConvertEbook. It also has many enhancements and new features in comparison (i.e. window position is remembered on closing, etc). I have also updated my UpdateFromOPF program (v2.1), to support using it on exit instead of calibre (as an option). UpdateFromOPF updated, to v2.1 , see Post #5. Extra screenshots added. (v2.1) Modified the floating 'Start' toolbar, and the 'Run calibre on exit' option, so that another program can be used instead, on exit etc (i.e. 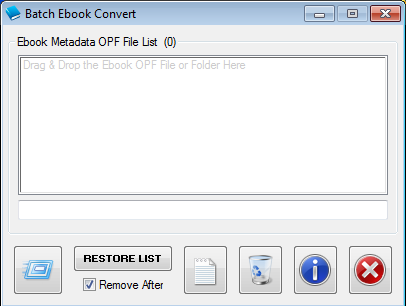 my 'Batch Ebook Convert' program). The window position for the Dropbox is now remembered on closing. Added a ' Quick Summary Of Usage (in order of use) ' section to first post. AZWPlug updated, to v3.8, see Post #3. Improvements added, mostly to the Dropbox. Dropbox has some more handy right-click options (PASTE and FIND). FIND can be used to find missing ebooks from the database, that exist in the 'My Kindle Content' folder, giving an option to SCAN and ADD if desired. If PASTE is used with the full path of an ebook (AZW or MOBI), then ebooks can be added into the database that way, with SCAN. NOTE - FIND can be used instead of Drag & Drop, so may prove to be a handy replacement process for that. UpdateFromOPF updated, to v2.2 , see Post #5. BUGFIX for the Author FIX button, where a value wasn't cleared and the Author name was being duplicated if clicked more than once. Mouse now needs to be moved slightly less for cover preview to close. Finally remembered to give a browse method to set the OPF file viewer program (default is SciTE if found at the standard location or Notepad). ADVICE - Clicking the VIEW METADATA button again, with CTRL held down, allows browsing for an alternative Viewer. NOTE - Until now, the VIEW METADATA button executed whatever program was associated with OPF files, which for me was SciTE. My apologies for not fixing this sooner. 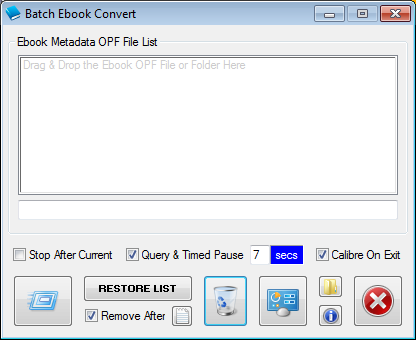 Batch Ebook Convert updated, to v1.1, see Post #41. (v1.1) BUGFIX for '&amp;' in the metadata file when doing a title check search. This only impacted the return when ampersand was found in title (i.e. Peaches & Cream). Add Book & All Formats To Calibre updated, to v2.3, see Post #4. BUGFIX. BUGFIX for '&amp;' in the metadata file when doing a title check search. BUGFIX for run calibre on exit. Added an extra option of a floating Start toolbar, to the 'Run calibre on exit' option, that has a START and CANCEL button. Add Book & All Formats To Calibre updated, to v2.4, see Post #4. The current position of the FIND AUTHOR window can now be saved precisely, from a button on the SETUP window. Author Information dialog now has an option to View the Log file. UpdateFromOPF updated, to v2.3 , see Post #5. Fairly minor update, but handy for me to save on repeated clicks, mouse up and back down etc. (v2.3) Support added to Minimize the Metadata viewing program (i.e. SciTE) when SAVE is clicked. UpdateFromOPF updated, to v2.4 , see Post #5. Includes very minor bugfix. Improved restoring of a title to title field from the title sort field, when a ', The' variant exists. This is done with CTRL plus button click to copy in opposite direction. Changed the order of priority when extracting comments from the title field (bracket now first, then dash, then colon) (colon was previously first). BUGFIX - The wait (looped sleep) was increased for a slow Metadata viewing program startup (first use), to catch the correct Window handle & title. NOTE - That 'wait' value is now read from the 'Settings.ini' file, and so it can be manually changed. The default was 2 seconds, it is now 5, but not all of it is used if correct handle & title are detected sooner. For me, it is always the first startup that is significantly slower on my PC, and therefor hard to test for again once it has occurred, without a PC restart. There is a point, where if you have to wait too long, you are probably better off minimizing the viewer program manually. So I had hoped 2 seconds would be long enough, and it was fine for repeated use. IMPORTANT - That wait in the INI file is specified in milliseconds, so '5' is '5000'. UpdateFromOPF updated, to v2.5 , see Post #5. Mouse now needs to be moved slightly less again, for cover preview to close. In an effort to help speed up Metadata viewer window detection, for automated closing, the code has been modified again, plus an INI 'start' option added, which is the delay after starting the viewer before checking. The default was 500, but is now 1000 (1 second), which the user can modify in the 'Settings.ini' file. Right Trim for series has been improved for trailing punctuation etc. Bucket-for-URLs updated to v1.6. See Post #17. (v1.6) Added an option to just remove ALL the DONE entries on the list, in one process. (v1.5) Support added for a copied list of URLs that have blank lines between one or more of them. (v1.4) Removed the Left align of the Title input field, as it did not allow scrolling right. That meant we were back to Right alignment, which I did not want. So I implemented a left & right control to set the default alignment for when a List entry is selected. That means you can now set things to see the start or end of Title text, in that input field. If CTRL is held down now, while clicking the CHECKING IS DONE button, then the selection automatically scrolls to the next NOT DONE entry, without changing the status of the initially selected entry (which can save on manually scrolling and clicking). Last search text is now saved and returned on program start. NOTE - Still trying to chase down an elusive bug that appears now & then, to do with currently selected entry. Always fixed by a program restart and possibly a resort. I need to knuckle down and spend some time with the program, other than adding new features at need. AZWPlug updated, to v3.9, see Post #3. Just a simple update that allows my old eyes to feel better from no white glare, that gives the program a bit of color. The 'Ebook Display' window renamed to 'Ebook Database'. Added a 'Background Colors' option to the SETUP window for the other two windows (for Lists & Input fields). UpdateFromOPF updated, to v2.6 , see Post #5. Bugfix & improvement to Metadata viewer window title detection. NOTE - I had a misunderstanding with the Help file, and somehow did not pick up the issue in my previous testing, or perhaps I was distracted at a pertinent moment, and the testing got skipped. Anyway, the Help file should say 'Exact' match for ArraySearch parameter of '1', as I did not pick up on the 'Partial' for '2', until I did further testing, and I wasn't getting the return I was expecting. Anyway, the Metadata viewer window title detection is much faster now, well within the acceptable time taken range. AZWDrop updated to v2.0 - Just an update for the Dropbox part of the program, so still requires AZWPlug itself. See Post #3. AZWDrop is a dropbox for my AZWPlug program, and runs as an independent executable, though it is run from AZWPlug and interacts with it. Added an About right-click menu option with above description. Also a 'Skip' ability for ebooks you might always skip, never intending to ADD to the database or send to calibre from AZWPlug. Reset option to restore those skipped ebooks also added. NOTES - No doubt this update will be included in the next full update of AZWPlug (i.e. v4.0). P.S. AZWPlug was developed on my old Win XP Laptop with AutoIt v3.3.0.0. and still updated there. AZWDrop on the other hand, was created on my Win 7 Netbook with AutoIt v3.3.14.2 and is updated there. A marriage blessed by Dog and celebrated by all Donuteers everywhere. P.S.S. Uploaded from my Win 7 Netbook .... in case you were wondering. AZWDrop updated to v2.1 - Just an update for the Dropbox part of the program, so still requires AZWPlug itself. See Post #3. Added a 'Count of ebook files' right-click menu option, that also reports total size of 'Kindle Content' folder. Changed the way ebook files are skipped, so they are no longer part of the total count of unlisted ebooks. See previous post for some relevant extra detail. Add Book & All Formats To Calibre updated, to v2.6, see Post #4. Added support for multiple file and or folder drag & drop. Added multiple sub-folder support (first level only). I finally relented and added those two new abilities, as the benefit of them became more readily apparent over time ... when processing lots of ebooks at once, which is certainly a situation I have right now, but normal usage not so much. Add Book & All Formats To Calibre updated, to v2.7, see Post #4. Drag & Drop Input field text updated. Total count of ebooks added, existed or failed is now recorded and reported, when more than one ebook is drag & dropped. Just some improvements related to feedback.